Laguna Blue towels give you one less thing to worry about. · are antibacterial (based on laboratory challenge with MRSA) · use 50% less water · dry quickly · use less energy · are non-linting · are fade-resistant · Our unique differences? Bacteria Resistant Cotton towels can become transmitters of germs including MRSA and E. coli. Laguna BlueTM towels resist bacteria, keeping your family healthy. 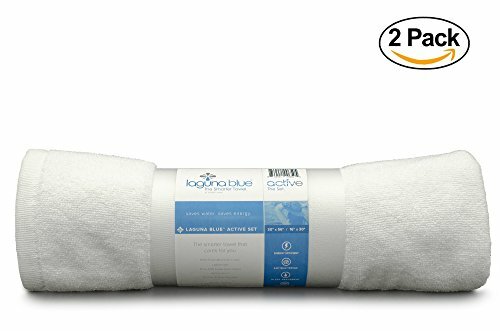 Soft and Absorbent Laguna BlueTM towels have a unique knit that absorbs liquid faster yet dries twice as quickly as a cotton towel-all while maintaining a luxurious feel. Eco-friendly The washer and dryer use the most energy of any household appliances, but Laguna BlueTM towels use less water and less energy-saving the environment while saving you money. You will have peace of mind no matter your activity that your towel will work as hard as you do while staying active. Upgrade your gear with The Smarter Towel. EFFICIENT: Compact towel holds 7x weight in water. Wicks away sweat, perfect for face and body. If you have any questions about this product by Laguna Blue, contact us by completing and submitting the form below. If you are looking for a specif part number, please include it with your message.